Geelong has proved to strong for Essendon in Saturday afternoon’s VFL match at Windy Hill running out 38-point winners. The Cats got off to a flying start with a five goal to two opening quarter setting up the lead which the Bombers could never peg back. Defender Tayte Pears (25 disposals and 9 marks) continues to push claims for senior selection with another best on ground performance across the half back line. Small forward Cory Dell’Olio (four goals_ once again provided an important goal kicking option up forward finishing the game with four goals. Development coach Paul Corrigan said the Cats were simply too strong and experienced around the contest. “A lot of our guys can take out of the game that you actually have to play four quarters of footy,” Corrigan said. “We showed in spurts that we can match it with them but we probably let ourselves down at periods in the game where we leaked goals. The only glimpse of hope for the red and black was during the third quarter when the home side kicked the last five goals of the third quarter but quick goals to open the last term killed off any challenge. The Cats run out convincing 38-point winners with an impressive display of handball and running moving forward. Small forward Alwyn Davey made a successful return from injury and looked lively in his three quarters of football. The Bombers will now turn their attention to Sandringham as they search for their third win of the season. 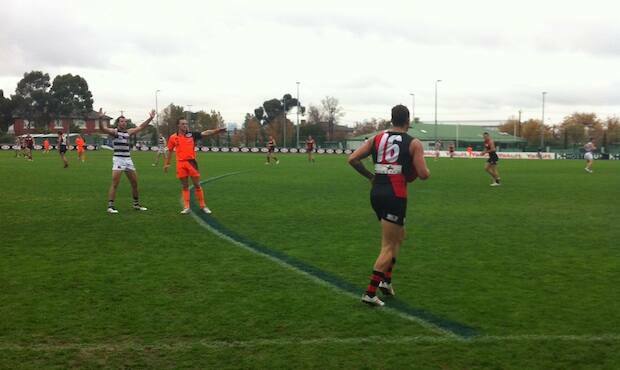 Goalkickers: Dell’Olio 4, Daniher 2, Colyer 2, Bate 2, Hunter, Z. O’Brien, N. O’Brien.